Demos of the games and links to download the code are available on this page. Additionally, Chapter 5 (platformer) has a free preview of the text. What will I be able to make after reading this book? Each of the chapters in this book teaches how to make a game in minutes or hours, instead of days or never at all. You can demo the games and download their source code to the right of this page. I'm not a total beginner. Would I still be able to get something out of this? "A wonderful overview of the HTML5 Game Development landscape, covering a wide range of tools and 10 different game genres." "It is not only a book about libraries: it teaches how web pages work, how games work, and how to put everything together. Study one, learn three: best deal ever." 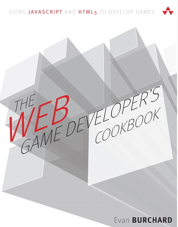 "The Web Game Developer's Cookbook is a fun hands-on introduction both to building games and to web technologies. Learning through making is an empowering, exciting first step." "With a friendly and reassuring tone, Burchard breaks down some of the most well-known gaming genres into their basic ingredients. The Web Game Developer's Cookbook transforms a seemingly daunting task into an approachable crash course even for those who've never written a line of code before." I'm not sure it's for me. No problem! The demos on the right of this page and the sample chapter should give you enough information to make a good decision on whether or not it's your kind of thing. If you still have any questions, please feel free to email me. I've been there. Please let me know more about your situation, and I'll see what I can do. Awesome! Thanks! I thought I might have missed something. Please email me so that I can clear it up for you and everyone else. You can check for known issues by visiting the errata section in the github code repository here. Okay. I want the book. What do I do? Sweet! You can get it right here.